The new Burberry collection will be unveiled as normal during London Fashion Week on 19 September, but today the British brand made a novel move – in line with its bold new strategy – by releasing the latest ad campaign images over a month beforehand which tease the upcoming collection. Essentially, you can preview the clothes at the same time as the fashion industry. Traditionally, a brand will show its collection, a few months later release a splashy ad campaign replete with big name models and a creative angle, and six months after the show we can go and shop the clothes we’ve been lusting over on Gigi, Cara, Kate, etc. for what feels like forever. Burberry’s innovative plan, which was announced back in February, is to make the clothes immediately available for purchase after the show, thereby creating a ‘seasonless, immediate, and personal’ mega-brand. It’s all got a little confusing in the fashion industry and you may have heard many tales of designer’s adopting ‘co-ed’ (mixed mens and women’s) show models or ditching the autumn/winter and spring/summer categories for something that you can ‘see-now-buy-now’ instead. 1. At the show itself, both womenswear and menswear will be shown together on the catwalk for Burberry’s inaugural ‘straight-to-consumer’ show. 2. The brand have bid farewell to their iconic Kensington Gardens base and have announced a new show venue named ‘Makers House’, which is located at 1 Manette Street in the heart of London’s Soho. This move takes the show closer to the London Fashion Week official show space in Brewer Street Car Park. 3. The new Burberry ‘It’ bag will be ‘The Bridle’ – a unisex shoulder bag that you can check out in the campaign images. It features classic British equestrian elements (natch) and the brand’s signature chequered print. 4. The campaign was shot by famed photographer Mario Testino against the impressive backdrop of Liverpool’s Walker Art Gallery, and features British models Jean Campbell and Alex Dragulele, and musician Cavan McCarthy (from the band Swim Deep appaz). 5. For the collection itself, Burberry has teamed up with ‘The New Craftsmen’, a homeware and lifestyle collective who represent a network of some of Britain’s finest craftsmen. 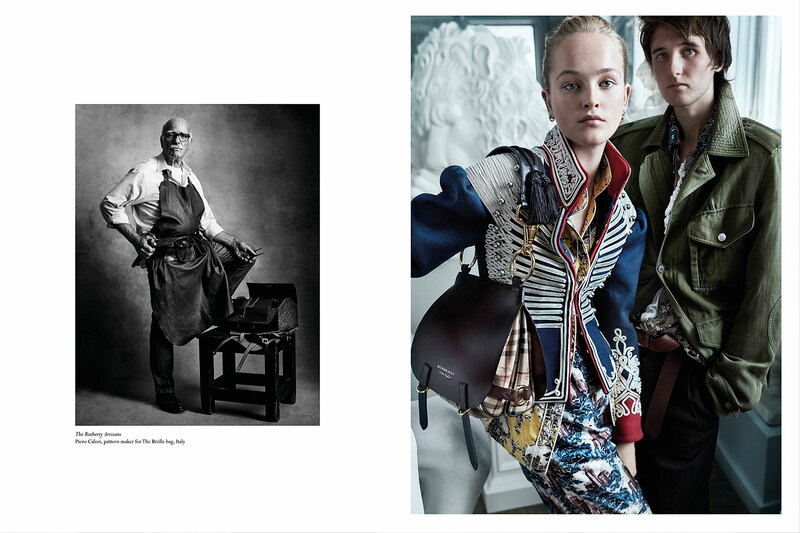 The pattern-maker behind The Bridle, Piero Calosi, features in a portrait shot in the campaign. 6. The collection was inspired by Virginia Woolf’s Orlando and contrasts masculine and feminine styles across different periods in history. The anticipation over what we can expect at London Fashion Week next month is seriously ramping up.